The Simley Youth Football Association has made the commitment to provide a safe, positive and productive experience for their youth football participants. 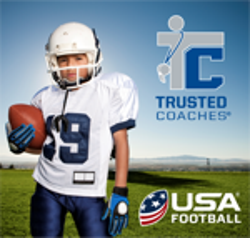 USA Football and Trusted Coaches (TC) have teamed up to provide football specific training on the Trusted Coaches platform while also delivering core components of the TC program to all youth football organizations since 2017. Along with components of Trusted Coaches, all youth football coaches will also have the opportunity to complete the USA Football Heads Up Football Tackle Coach Certification and complete training, screening and education through Trusted Coaches. Trusted Coaches is a comprehensive online program that offers essential training, education and screening necessary for a youth coach. Metro East Youth Football League link is below. Please got to there sight to find our game schedules, filed locations, league rules, rain out app, etc. Special Thanks to our Local Sponsors of IGH Youth Football!